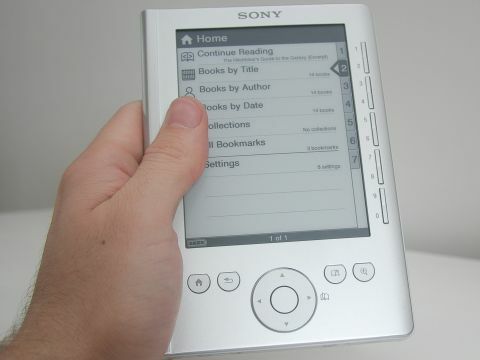 Will the Sony Reader Pocket Edition be the first big-hitting eBook reader in the UK? Compare the pain of dragging three thickset Booker Prize candidates to the south of France with you with the 220g weight of the Sony Reader Pocket Edition and you're halfway to understanding the appeal of eBooks. But with Amazon's Kindle arriving in the UK imminently, should you burn your bookshelves just yet? Small, light and very good looking are three ways to accurately describe Sony's gorgeous device. It's just one centimetre thick and the screen is a pleasure to behold. It measures 5 inches diagonally, and despite the low sounding resolution of 800x600, text displays much more crisply than it does on the finest LCD. Better yet, because the Pocket Edition uses E Ink, it only draws power from the battery when it's asked to refresh the screen. That means you can leave it on the same page almost indefinitely and the battery won't die – Sony claims the battery lasts up to "nearly" 6,800 page turns. The Pocket Reader is easy to use. Ten buttons arranged down the side of the screen allow you to make menu choices. You also get shortcut buttons to return to the main menu, bookmark a page and, usefully, choose from three levels of zoom. You can also scroll through the menus using the four-way direction pad at the bottom of the device, but this brings you up against one of the Reader's inherent problems – the time it takes to redraw the screen.